A distraction a day is the only weapon that Barack Obama and his re-election campaign operatives have in their arsenal. President Obama, having no achievements to tout in his failed three years in office, makes every speech an attack. Pick the topic; contraception, Wall Street, the wealthy, racism, religion, the Supreme Court, the environment, energy, health care, the Ryan Budget, the Republicans, Mitt Romney and the “war on woman”. 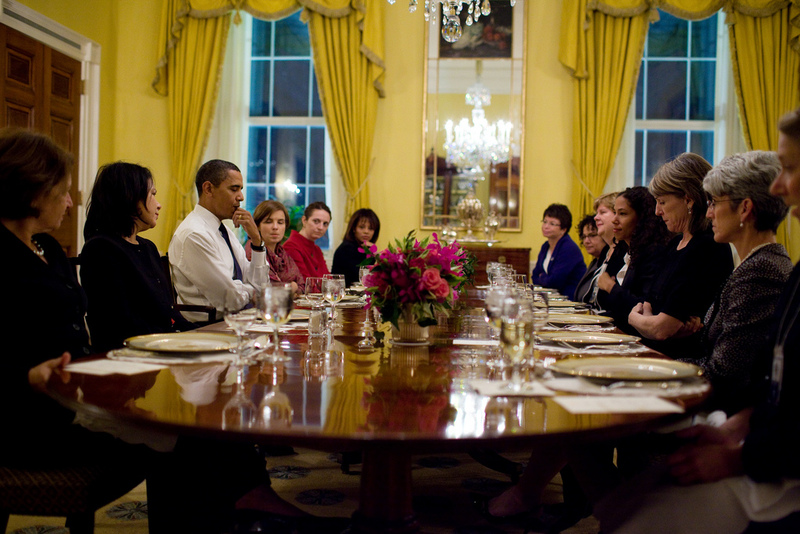 Obama meeting with female staffers to air their complaints, November 5th, 2009. I have never seen a more divisive and nastier president than Barack Obama, who is truly waging a war on every good citizen in America. The Democrat operatives and Obama himself can spew all they want on their latest phony issue, the “Republican War on Woman”. But the truth is that Barack Obama has one of the worst records when it comes the treatment of woman, even in the White House. In the book, “Confidence Men: Wall Street, Washington, and the Education of a President,” by journalist Ron Suskind, women have occupied many of the West Wing’s senior positions but felt outgunned and outmaneuvered by male colleagues. Ironically, on Wednesday the Obama campaign attacked Mitt Romney for not endorsing the Lilly Ledbetter Fair Pay Restoration Act, that made it easier to file discrimination lawsuits by increasing the law’s statute of limitations. Yes, the War on Woman, especially Conservative Woman — sounds familiar doesn’t it. It’s a Democrat theme, whether it’s Sarah Palin, Michele Bachmann, Ann Coulter, Nikki Haley, Jan Brewer, Michelle Malkin. Any woman that defies the statist view of how woman should live their lives as espoused by Barack Obama and the entire Democratic party. Standing up and being outspoken to this administration means you have to expect a withering attack on your beliefs and person. It’s entirely un-American and designed to force you to surrender to the state and be dependent on government, forever. We are not Russia, or Cuba or any Islamic state. This is the United States of America. In order to keep it safe from the most destructive and left-wing president this nation has ever elected, we must be a force for justice and turn out in the greatest numbers ever to throw Barack Obama out of office. We can end this war on all American by voting for every Republican candidate running for office in November.